The Largest Lake in Every State (Located Entirely in a Single State). This post was updated to include lake types as well, which revealed something very interesting: 80% of these lakes are reservoirs or dammed natural lakes. Defining the largest lake in a state is not always straightforward. That’s because the largest can be the lake that covers the greatest surface area, the lake that holds the most water, or both. Let’s take North Carolina for example. Lake Mattamuskeet, which spreads over 63 square miles, is the largest lake in terms of surface area, followed by Lake Norman, which is 51 square miles in size. However, because Lake Mattamuskeet only averages a depth of 2 feet, it holds much less water: 0.024 cubic miles, compared to Lake Norman’s 0.32 cubic miles, a volume that’s 13 times greater than that Lake Mattamuskeet. 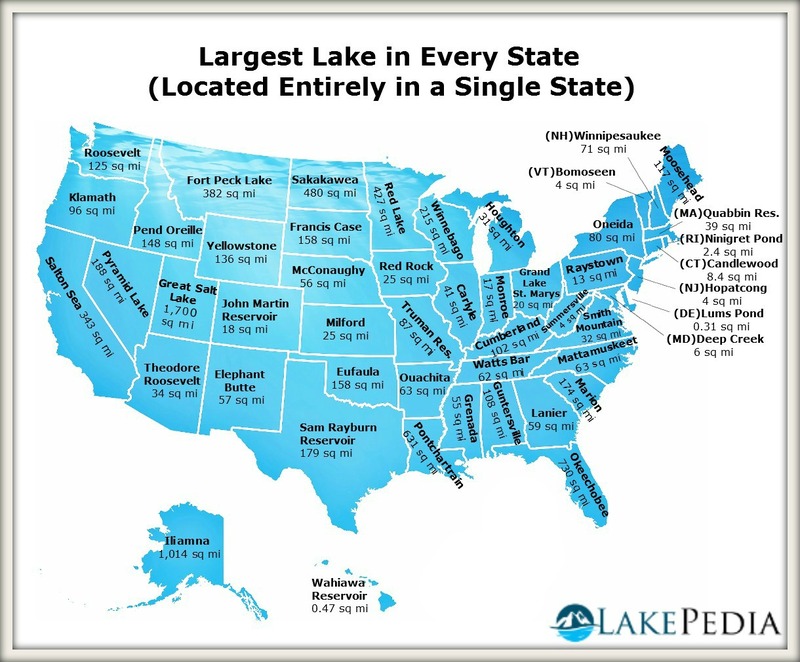 However, since most people associate largest with the greatest area, we’ve decided to create this map of the largest lakes in every U.S. state based on surface area. From the Great Salt Lake in Utah, which is the 6th largest lake in the United States, to Lums Pond in Delaware, these lakes come in all shapes and sizes. It’s interesting to note that many of these lakes, 62% to be precise, are reservoirs. As a matter of fact, reservoirs and dammed natural lakes account for 80% of all the lakes in the list. Interesting! It would be cool to point out how many of those are *natural* lakes, vs reservoirs too.. Thanks for the suggestion, that’s a very good idea. Thanks! This is cool. You should do one for volume too, that would be interesting to know.